Sure it has been available for quite some time now, and for a period of time there, the Samsung Epic 4G has stood at the top of Sprint’s lineup as being its best Android powered smartphone. Of course, price drops are always around the corner, especially when newer handsets come into play, but for the Samsung Epic 4G, we’re seeing yet another drop in price to make it extremely hard to not take notice. 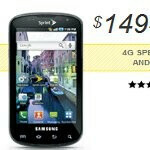 Previously, we saw the handset get a $50 price drop to $200 on-contract back in January, and now that the Google Nexus S 4G is now available with Sprint, it’s only natural to see it get chopped yet again. Now priced at $149.99, it makes it seem more valuable than the equally priced HTC EVO 4G Shift – especially when you have that gorgeous Super AMOLED display and video chat support with its front-facing camera. As we get closer to its one-year birthday, there’s no arguing that we’ll be seeing yet more price drops in the near future. Still, the $149.99 pricing it’s flaunting right now it more than acceptable considering the high caliber status it’s embodying. No, this happened about a month ago! WTF??? Lets hope this is signs to come of the Samsung Epic 2. Maybe a 4.3 inch super amoled plus display with a improved and larger slide out keyboard. Android 2.3.4 with a dual core processor. only 49.99 at Radio Shack with a trade-in. Sounds like Sprint is clearing inventory in advance of a new announcement.... I wonder when the new announcement will happen.